Our customers are very important to us, and we want to make sure you have everything you need. If you can't find what you are looking for, then please contact us via phone 01823254646 or email info@judithgossflorists.co.uk and we'll be happy to help! You tried placing an order, but it didn't go through. What can you do? We apologize for the inconvenience caused to you. please check that you are putting the right address and post code with the card you are using if that still does not work we can take pay pal which is an option for payment. If not we are more than happy to help you place your order over the phone 8am to 4.30 pm Monday to Friday and 8am till 1pm Saturdays. Please call us at 01823254646 and we would be glad to hear from you and also we could find why the site didn’t work for you and give the information to our web designers with your problems. 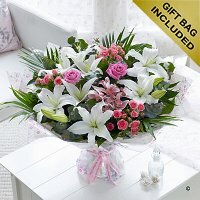 All our florists know which flowers work well together in arrangements and bouquets etc, which flowers last longest and which are easiest to care for. They also understand the cultural aspects of floristry in the UK and Ireland; for example a suitable flower arrangement for a new baby or an appropriate tribute to send to a funeral. Use fresh lukewarm water with commercial cut flower food added. Strip all leaves below the water level. Take at least 3cm (1") off all stems, making a slanted cut with a sharp knife or very sharp scissors. Avoid draughts heat or direct sunlight which can shorten the flowers' lives. Top up the water regularly and add flower food in proportion. Buy flowers from a reputable outlet, and choose blooms with firm petals or with buds that show a degree of colour to ensure the flowers will develop fully. Ensure the flowers are well wrapped for protection and, if the flowers are to be kept out of water for some hours, ask the florist to cover the stem ends with damp paper, or even to "aqua-pack" them in their own water `pod'. Ask for cut flower food if it is not already supplied. d) lengthen the life of the flowers. Snipping the corner off a one-dose sachet and adding it to the vase water is simple and effective - and scientifically tested to make your flowers last longer. Use lukewarm water - there's less oxygen in it, and helps prevent air bubbles in the stem that will block water uptake. It also encourages some flowers to open up. The only exception to this is spring bulb flowers like daffodils and tulips which prefer cold water. Use thoroughly clean vases - bacteria kills flowers. Cut stems at an angle. This gives the stem a bigger area to take up more water, and stops it resting on the bottom of the vase and sealing itself. Follow the care and conditioning stages outlined below to prolong the life and beauty of the flowers. Smash or pierce the stems, or use blunt scissors, as this destroys the water vessels and inhibits water uptake, and causes bacteria to multiple more quickly and over a larger area. It also causes the flower undue stress which shortens its life. Mix daffodils and narcissus with other flowers. They emit latex from their stems when cut, which is known as `daffodil slime', and shortens the life of other flowers. Keep daffodils alone in vases, or use the special bulb cut flower food which makes them safe to mix with other flowers. You can place the daffodils in a bucket of water for at least 12 hours on their own and then arrange them with other flowers, making sure you do not cut the stem again. In the event of pollen stains: use a dry brush or sticky tape to remove. Never use water. If stains persists, place the clothing in the sun and the pollen will disappear after time. Looking after houseplants is not difficult, but some may need special attention. Buy plants with a specific care label with a botanical name on it. This helps you identify the three key elements your plant needs to grow, and therefore where it would be happiest - how much light the plant needs, how warm it likes to be, and how much water to give it. Try to choose houseplants that like the conditions in your home or the way you look after your plants. For instance, if you have warm sunny rooms cacti are ideal; whereas shady areas would suit ferns or ivy. Azaleas are ideal for those who over water plants; and for those who forget! Don't forget to feed your plants regularly - to give them the energy to flower, produce new roots, and encourage healthy leaf growth. There are many different types of plant food available - make sure you use one for either flowering or foliage plants, as appropriate, as the ingredients are different. If you have plants with broad glossy leaves, give them an occasional wipe over with a damp cloth. The plant's 'lungs' are in its leaf surface - and if it's choked with dust it can't breathe. New plants will not need feeding as the compost contains enough nutrients for at least six weeks growth. Some flowering houseplants have a dormant period when they recuperate after a season of growth; during this time they need less watering and feeding. Talking to plants is not so daft either, as you are breathing carbon dioxide on them, which they need to survive. It also allows you to inspect, close up, for pests and diseases or signs of stress. Quality of your plants is vital, so inspect them well before you purchase and only buy from a reputable source. Choose houseplants with lush healthy leaves and new growth. Buy flowering plants when the buds are just opening; and remove dead flower heads to encourage new flowers to open. We hope this gives you fresh new ideas for using plants in your home or work! Remember all living houseplants help increase feelings of relaxation and well being, and help you breathe more easily. So whatever houseplants you choose to have around you, they will improve your mind, body and spirit - as well as beautify your surroundings. Most orchids will live in a clear container with a potting medium such as soil and bark. This will then sit inside a holding pot like the one pictured. Using distilled or recently boiled and cooled tap water, fill the clear orchid pot and holding pot so that the orchid roots are fully submerged. After 10-15 minutes remove the orchid from the water and allow it to drain for 5 minutes. Pour the remaining water out of your holding pot. Once the orchid has drained away the excess water, pop it back inside the holding pot and return it to its home. Depending on where the orchid is placed temperature of room and the time of year, submerge it once a week when they are actively growing (The start of flower stem production is caused by a drop in daytime temperatures in September, after flowering finishes, but prior to the central heating being turned on in most households. The new flower stem becomes clearly visible a few weeks later) to once every 2 weeks when they are not shooting new growth. Phalaenopsis orchids generally require brief dry periods between every watering.. The new flower stem becomes clearly visible (see picture below) a few weeks later. once a week when they are actively growing (see above) and once every ten days when they are "resting". Our watering method is to fill a large container (about 15cm / 6in deep) with tepid (room temperature) rain water is best. Avoid getting water into the crevices of the leaves. If this happens, grab a towel and dab any excess moisture away to prevent rot. If submerging isn't your thing or if the orchid can't be removed from its pot, you can try the pouring method. Simple pouring is still fine to water orchids. If the orchid cannot be removed from its larger pot, be mindful that it may not have any drainage holes. In this case, water sparingly as orchids will suffer when they are standing in pooled water. Also, make sure the water is not poured directly onto the plant and is poured into the roots underneath the leaves at the base. Watering can be a little bit of trial and error. Keep in mind that long summer days may require you to water the orchid more and short winter days will require less watering. Roots that are green are getting just the right amount of water. Roots that are soggy and brown are getting too much water. Roots that are grey or white are not getting enough water. Humidity is important as it recreates the conditions of an orchid's natural habitat, which of course helps them thrive. There are multiple ways of creating ideal humidity for your plant but by far the easiest method for indoor orchids is to mist them regularly. Misting is simply spraying an orchid regularly with a fine mist spray bottle. Spray the orchid leaves and any aerial roots up to two times a day depending on the plant's location in your home. This may sound like a lot but water very quickly evaporates. Do a finger test if you're worried about overwatering. If possible, use distilled or water boiled in the kettle and cooled for your mist bottle. Standard tap water is laden with impurities, which can cause the orchids leaves to become covered in white crust. This can be unsightly and can also block moisture from entering the leaf. Like most plants, optimal light is the absolute key to keeping orchids happy. Under no circumstances, place the orchid in direct sunlight, as they will get sunburnt - yes, really! It can happen in a matter of hours, so keep your eyes on the light the orchid is receiving. An ideal place for the orchid to live is in a room that stays at a consistent temperature through the day, away from drafts, fruit and where it can receive indirect sunlight. Indirect sunlight is simply sunlight that has been filtered by bouncing off a wall or through an object before hitting the orchid. The simplest way of measuring light intensity is to use your hand. It sounds strange but, at the height of the day, when the sun is pointing through the window at its brightest (a bright day is best to try this rather than overcast), put your hand a few inches above the plant’s leaves so that you cast a shadow over the plant. If there's little to no shadow then the light intensity is too low. If the shadow is a soft light grey then the light intensity is perfect. If the shadow is very strong and dark, this indicates too much light. Alternatively, you can make things even easier and freeze your feed mix as well as your water. Just like ice cube watering, this great orchid tip allows the food to be absorbed by the orchid much more effectively. It also prevents the possibility of burning or over fertilizing the orchid. Just make sure you label your ice cube tray so you don’t end up with a strange taste in your gin and tonic! How Often Do Orchids Need Pruning? When the orchid peaks its blooming period, its new flowers will last up to 12 weeks. After this time, they may fade, droop or fall off their stems (spikes) when they are spent. Healthy stems are green and firm to the touch. Unhealthy stems are brown/yellow in colour and hard to the touch. Cutting back an orchid for the first time can seem daunting. Nevertheless, by following the next few tips, you should expect the orchid to produce their beautiful flowers for its next blooming cycle (providing all other care instructions are followed of course!). If your stem is healthy and this is the first prune. Trim the stem just above the stem notch/node where the first flower had bloomed. This will allow a new shoot to emerge. If your stem is unhealthy or you have already re-bloomed your orchid pruning once already, it is best to cut an inch above the base of the stem. This allows the orchid to focus its energy into producing new strong leaves and roots.